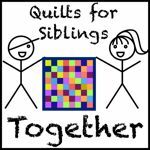 I thought I was on a quilt making mission when at the end of the week the children started talking about World Book Day (is it really across the World or just the UK?). Our school has decided on the theme of Heroes and Villains but I think that’s fairly irrelevant as each child will just pick someone they want to dress as! Bethan has decided that she would like to go as Pippi Longstocking and realised that she doesn’t actually have any dresses to wear! Ok there is a dress from Zara that she wore when she was a bridesmaid a year ago but that’s too nice and not suitable according to her. I knew I had some dress patterns but wasn’t sure if the sizing would be big enough for her now. 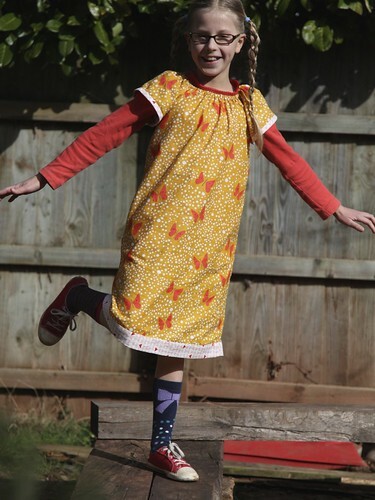 But the Sweet Little Dress by Leila and Ben goes up to age 10 so I was fairly confident that this would fit her fine. I had the pattern already printed out so we stuck it together and had a look at how much fabric we might need and what we had stashed. 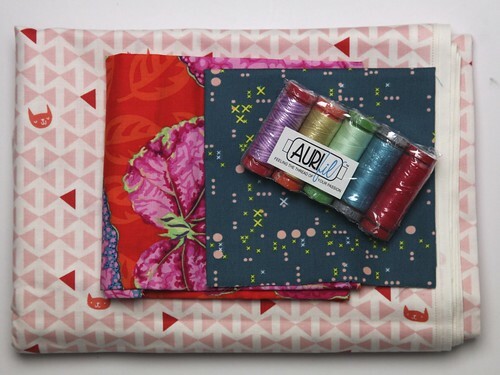 The pattern suggests 2 yards of fabric and like many of you I don’t stash many large pieces of fabric as much of my sewing is patchwork. 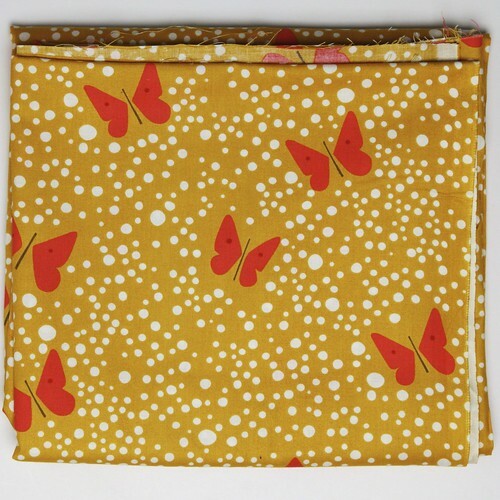 Both were bought because they were real bargains so while I had them in mind for quilt backs I don’t have particular quilt(s) in mind so it seemed slightly odd to not use them for clothing! Bethan decided on the yellow with the pink for trimming. 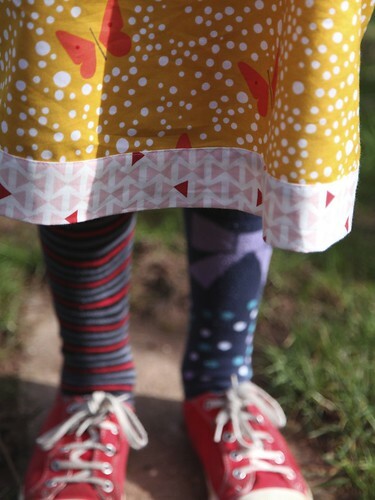 I’ve made this dress previously for Bethan so I was familiar with it. 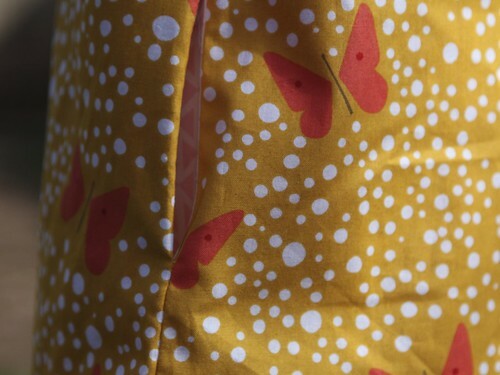 But knowing my daughter I asked if she wanted pockets and we agreed that inside pockets in the side seam would be a good plan. The neck is elasticated and when Bethan tried on the dress we loosened it off to fit and she decided at that point that she preferred the sleeves without elastic. Rather than turning up and hemming the sleeves I added a bias binding strip of the pink fabric and finished the hem of the dress in the same way. I think she’s pretty pleased with it and the bonus is that her favourite long sleeved t-shirt goes perfectly with it. I’ve not read Pippi Longstocking so have no idea if this is something she would wear but Bethan is happy with it so that’s fine! 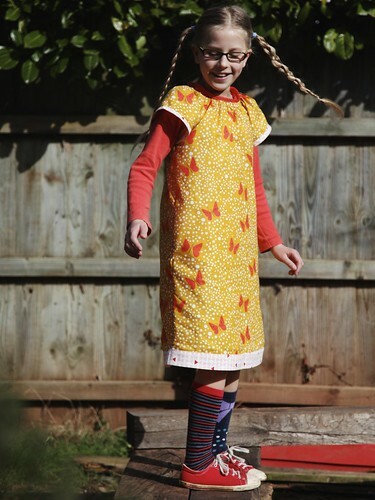 The deal was that it had to be something she would wear at other times too – no way was I making a dress just for World Book Day and since I finished it this morning she’s not taken it off, so I’m taking that as success. I hope that if you have small children you’re not stressing about a costume for Thursday! She looks brilliant and the dress is perfect for lots of wear too!! No book day here this week, thank goodness!! We always end up with a playground of superheroes, harry potter”s or princesses!! My failsafe for the boys has always been Wheres Wally! Great make but I do feel for parents when World Book Day comes around because it seems to demand a fair bit of effort! Fabulous dress! Rosie is going as Liesl from The Book Thief – we are recycling part of her outfit from evacuee day… Must admit, I am rather jaded with all the outfits I have had to concoct, and glad this is the last book day before secondary school! We don’t really do world book day around here, I think that there’s just too much other stuff on at around the same time (St David’s Day, eisteddfod etc). They still get the book token from school though which is good. Pippi was one of my favourite books when younger and from what I remember she had stripy stockings and sticky out braids so I think your good to go! Something tells me she had a pet monkey too but I might have just made that up. 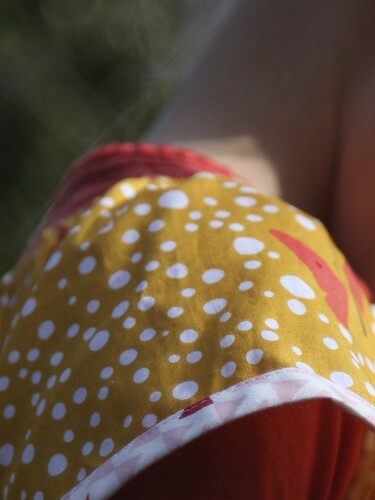 Love the dress – lucky you to have quilt backs in stock. I’d have been tempted to use a sheet ???? Love it! So joyful. The wee man’s favourite books have normal looking lads in them so that’s easy!